At Julianos Hot Rods we sell seat belts to trim shops across the country. One of the best is Vinny’s Interiors in New Britain, PA. You can tell by the quality of the seat upholstery, carpet fit and door panels that his work is top of the line. 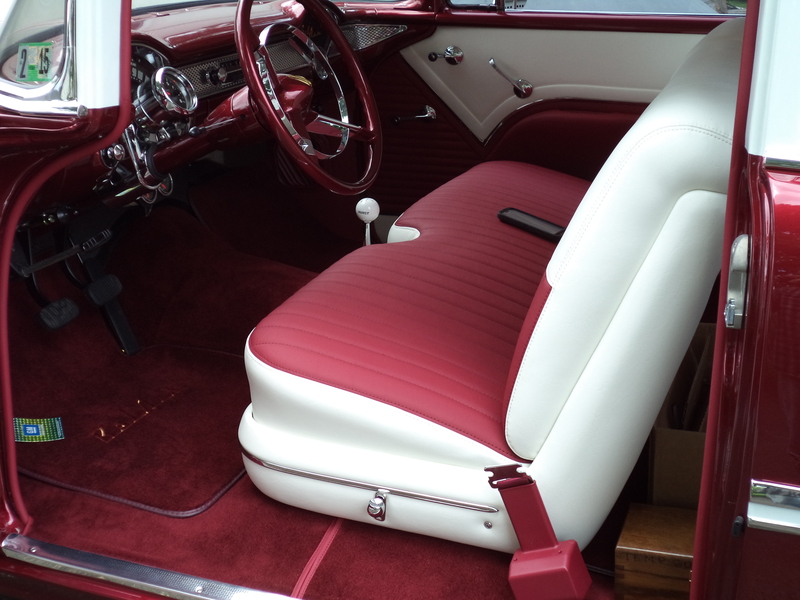 Vinny has used our seat belts on his interiors for years and this picture shows how well the chrome lift latchk seat belts and Chevy bow tie lift latch seat belts work in the tri-five Chevy cars. They have a 9.5″ tall retractor and it works excellent here. Note the mounting location and the slight forward angle of the retractor, everything about this is perfect. Thank you to Vinny’s Interiors for this pic. Click here to view our retractable lap belts.